Heat the oil in a deep skillet or large pot. Chop the onion and leeks and soften in the oil along with the minced garlic. Once softened, turn up the heat and brown the turkey mince in the pan, adding the chilli powder, cumin and pepper. Add the tomatoes and beans once the turkey is browned, then add and mix in the gravy powder, worcestershire sauce, tomato paste, lemon juice and honey. Grate the carrot into the pan and stir in. You can also add other veggies in the same way like zucchini or kumara if desired. Cook on a low-medium heat for 20 minutes, stirring occasionally. 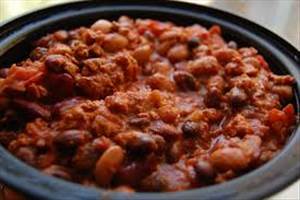 There are 190 calories in 1 serving of Turkey & Vegetable Chilli. Calorie Breakdown: 25% fat, 50% carbs, 25% prot.